UPDATE: I’ve added a comment by Marcel Crok to the end of the post. The climate models being used by the IPCC for their upcoming 5th Assessment Report show little skill at being able to simulate a number of variables. We can now add Scandinavian land surface air temperature anomalies to the list. Figure 1 compares the UKMO CRUTEM4-based land surface air temperature anomalies for Scandinavia, starting in January 1930, and the CMIP5-archived multi-model ensemble mean of the climate models prepared for the IPCC’s upcoming 5th Assessment Report (AR5). Both the data and the model outputs are available to the public through the KNMI Climate Explorer. The coordinates used were 55N-72N, 2E-30E. The climate model hindcasts are based on the historic forcings and RCP6.0 scenario. And both data and model outputs have been smoothed with 13-month running-average filters to reduce the monthly variations—what some would call weather noise. Also note that the linear trends were calculated from the monthly data and model outputs, not the smoothed versions. As shown, according to the models, if greenhouse gases were responsible for the warming of land surface air temperature anomalies in Scandinavia, they would have warmed at a rate that’s about 2 times faster than the rate observed. Or phrased another way, since 1930, Scandinavian land surface air temperatures warmed at rate that was half the rate simulated by the models. Not a very good showing on the parts of the models. Look closely at the surface temperature data in Figure 1. There’s a very obvious upward shift in the data in the late 1980s. It may be hard to see with the model output in Figure 1, so I’ve highlighted the 2-year period of January 1987 to December 1988 in Figure 2. 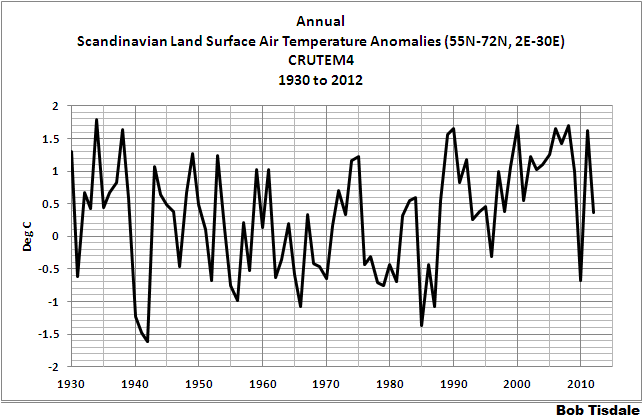 From 1930 through 1986, Scandinavian land surface air temperatures cooled. (Note the large dip and rebound at the time of World War II.) Then there was a very strong warming surge in 1987 and 1988, which was followed by the period of 1989 to present when surface temperatures don’t appear to have warmed much at all. So let’s compare the models to the data for the periods before and after that upward shift. Figure 3 compares the modeled and observed Scandinavian land surface temperature anomalies for the period of Jan 1930 to December 1986. Scandinavian surface temperatures cooled at a rate of -0.132 deg C per decade, but the models say they should have warmed at a rate of +0.058 deg C per decade. The models missed the mark by a rate of about 0.19 deg C per decade. 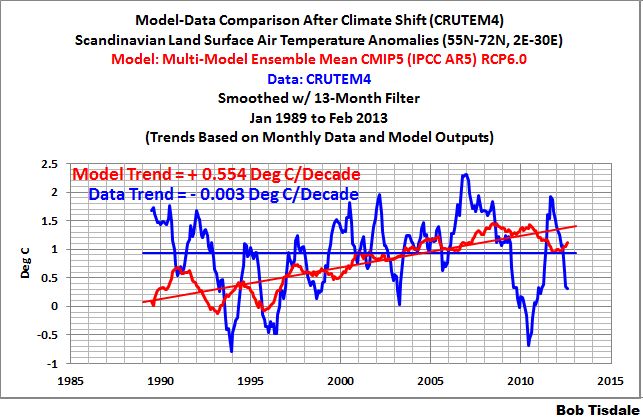 Or, phrased another way, based on the linear trends, the models say Scandinavian temperatures should have warmed about 0.33 deg C from 1930 to 1986, but surface temperatures there actually cooled approximately 0.75 deg C.
Then there’s the period of January 1989 to present. 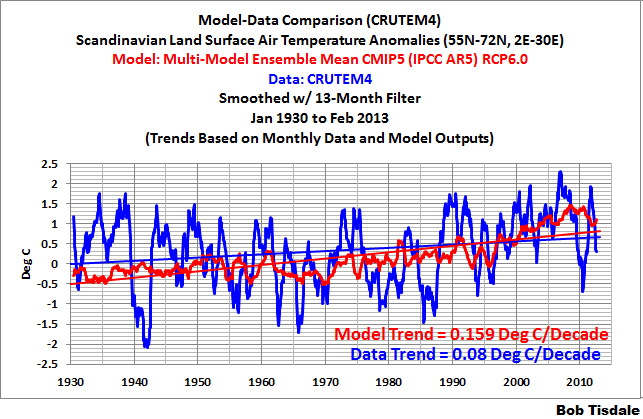 The climate model simulations indicate that Scandinavian land surface temperature anomalies should have warmed about 1.3 deg C over the past 23+ years (based on the linear trend) if manmade greenhouse gases were responsible for the warming. But, based on the linear trend of the observed temperatures, Scandinavian land surface air temperatures have not warmed. It’s probably a combination of a couple of natural factors. I did a quick search for papers that explained the shift but didn’t find anything conclusive. Scandinavian visitors may know of some and hopefully they’ll provide us with links. The Arctic Oscillation appears to have had a strong influence around that time. The Arctic Oscillation Index is based on sea level pressures north of 20N. Wikipedia has a good overview here. 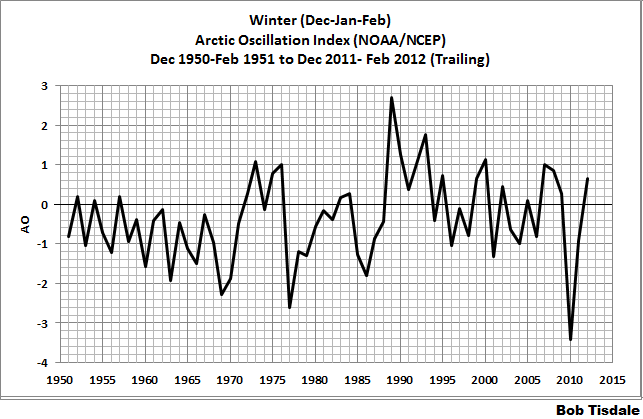 Also see the NOAA webpage here, and the Arctic Oscillation Index data here. 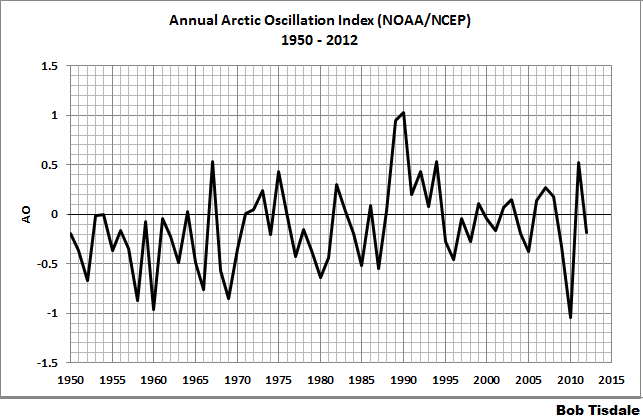 According to the annual Arctic Oscillation Index data, Figure 5, there was a significant spike in 1988 and 1989. The change in the Arctic Oscillation was most prevalent during the winter months, regardless of whether you define winter as December to February (Figure 6) or January to March (Figure 7). 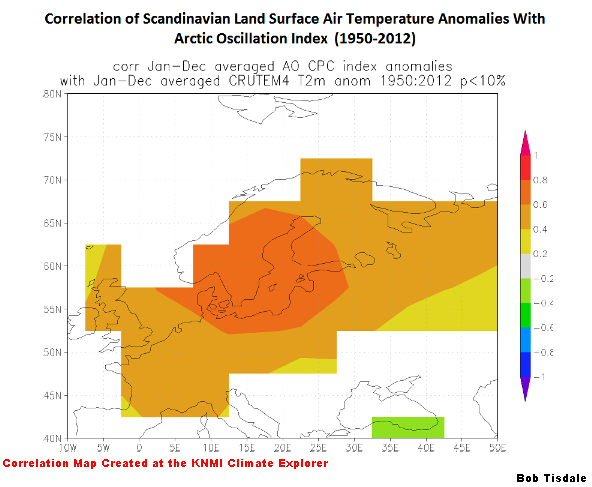 But using the full term of the Arctic Oscillation Index data, 1950 to present, the correlation between Scandinavian land surface temperature anomalies and the Arctic Oscillation is not as strong, Figure 9. That’s why I noted that it was probably influenced by a number of natural factors. 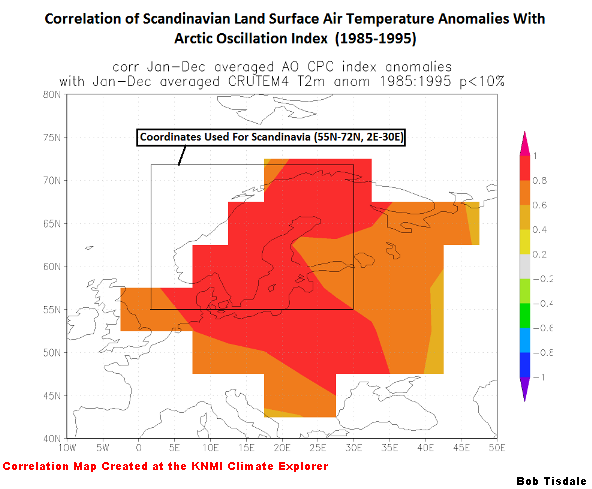 Some of you may be concerned that the shift shows up in the Scandinavian surface temperatures from January 1987 to December 1988, while the spike appears in the Arctic Oscillation Index data in 1988 and 1989. 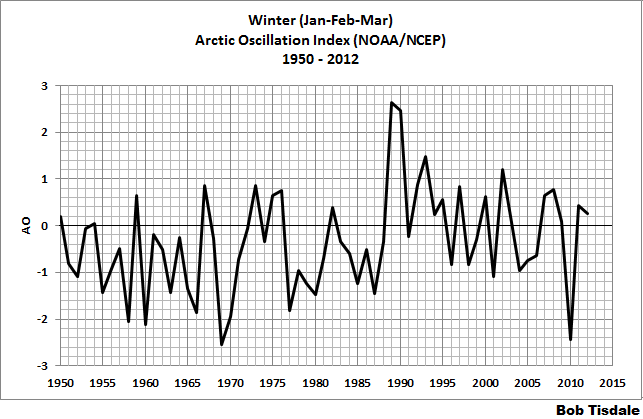 Sorry, I had used monthly data for the surface temperatures and annual data for the Arctic Oscillation Index. 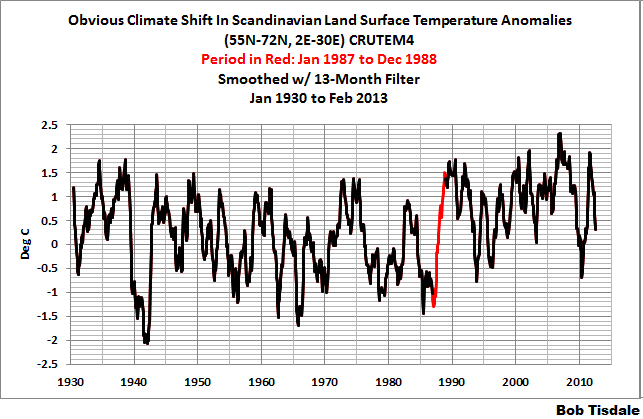 With the Scandinavian surface temperature anomalies in annual form, Figure 10, the shift appears in 1988 and 1989. 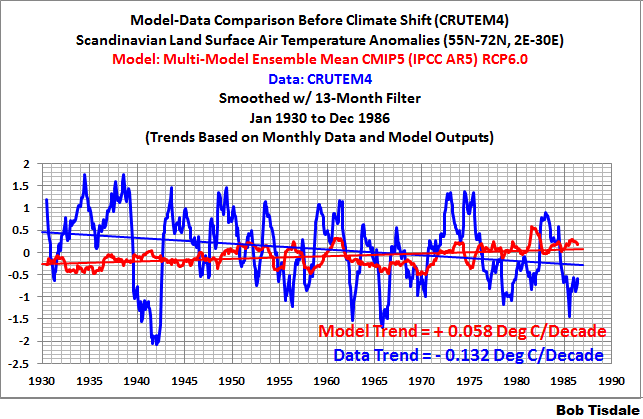 Regardless of the cause of the shift, the cooling of Scandinavian land surface temperatures before the shift, and the flat temperatures after it, were not captured by the climate models. Many thanks to Harold Ambler for prompting this post. Harold is the proprietor of the blog TalkingAboutTheWeather and the author of Don’t Sell Your Coat. We link it to the NAO and to the transition from dimming to brightening. This entry was posted in LSAT, Model-Data Comparison LSAT, Uncategorized. Bookmark the permalink. Thanks, Marcel. I’ll add it to the post as an update.